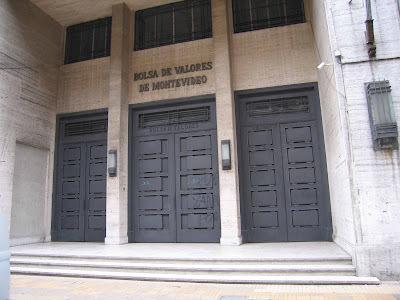 Uruguay does indeed have its own stock exchange, located in the Ciudad Vieja–the Old City–in Montevideo. The exchange itself handles only bonds and Uruguay companies. But if you ask at the Bolsa de Valores, they will give you a very long list of stock brokers in the city. Or you can get the list from me. We visited one broker on the list who also handled only bonds, but who underlined, on our list, the stock brokers that he knows and recommends who do handle stocks for their clients. A visit to one of them provided the following information. Gaston Bengochea & CIA can buy shares for you in major markets of the world. They do work with Mellon Bank in Pittsburgh, Pennsylvania, through Merrill Lynch–however you happen to feel about that at this point. They can hold your account there in the name of the brokerage, or designated in your own name, as you prefer. Or they can set up a custodian account for you in their commercial bank here in Montevideo. They do not provide stock certificates but hold all stocks in electronic form, but they can sell your stock certificates if you are now holding them. They also volunteered an alternative custodian in place of Merrill Lynch. It is the Julius Baer Group, a Swiss “boutique” bank that they have researched and recommend. Julius Baer requires a minimum of $500,000. A little rich for the blood of some of us but the option is there if you are interested and qualify. Of course there are other Swiss banks that have a lower minimum and will buy stocks directly for you on many exchanges, if that is what you are after. However, if you are a U.S. citizen, some of the banks that we know of will buy shares of foreign companies for you (Canada, Brazil, Asia, etc.) but will not buy U.S. shares. I am sure they would like to but they feel that they avoid a lot of problems by just saying no. Some of the Montevideo brokers only handle Uruguay investments, particularly bonds. Two stock brokers that we liked, who broker stocks worldwide, were Victor Paullier (Paullier & Cía., Misiones 1487 11.000, Montevideo l Uruguay Tel. : 598.2 916 10 40) and Gaston Bencochea (Gaston Bencochea & Cia, Rincon 477 Esc, 291, Montevideo, Uruguay Tel: 598.2 905 3318). At this point with all the manipulation going on in the markets, which the PTB is flooding with fiat dollarss, we are not so sure we are interested in the stock market except perhaps for precious metals shares. (Disclaimer: We hasten to advise you that we are not investment advisers, but only expressing personal opinion. It is always important to consult your own financial advisor before making investment decisions). Nevertheless, we want to bring you up to date. Paullier trades directly in the country where the investment is located, and trades anywhere in the world. So for some investors this might be important since U. S. brokers are limited in the investments they can trade for U, S. citizens, whereas Paullier is not. However, costs are high because Paullier does not have a seat in every exchange and they too must often go through local brokers. And . . . there is more. Both of these brokers will accept U.S. citizens. In Uruguay, no matter how much you make on the markets, Uruguay does not tax the gain. Therefore, for the non-U.S. citizen who has no tax obligation once they leave the country of their birth, if you are very astute in the markets, the gain is tax free. That sounds fantastic! Except . . . . . .
Uruguay charges the IVA tax on every transaction, whether you gained or lost money. So that pushes your cost of trading to surprising heights since, of course, they also add a brokerage fee comparable to the fees in the U.S. before the age of the discount broker. So these are some of the things to consider about investing through the Uruguay Bolsa. However, they tell me that they have U. S. clients with very large holdings. It would not surprise me if it is possible to negotiate commission if you are in that category. But you would still deal with the IVA. When we asked these brokers at the start about the costs, neither of them told us about the IVA. It is possible they assumed that we knew. In South America there are just things that take time to learn. If you have questions, please don´t hesitate to email us.